All medievalists know two things: first, the best stories of the Middle Ages come from [your research subject goes here]. 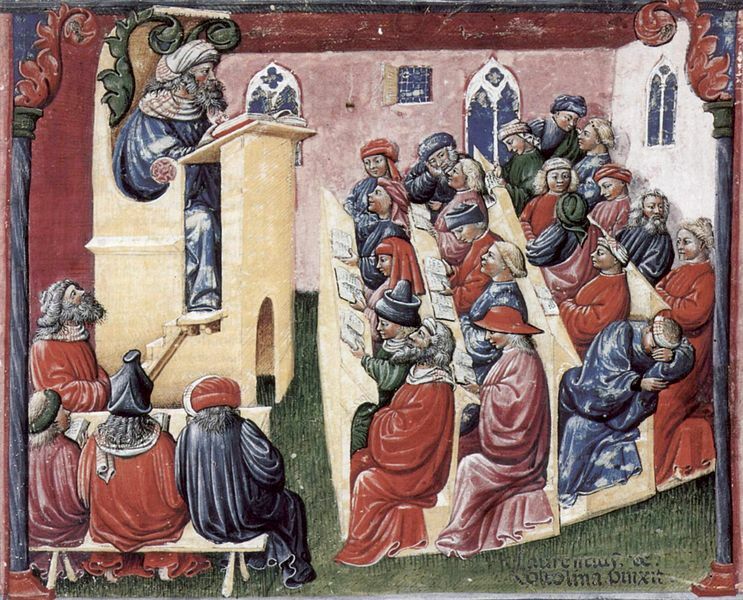 Second, the best stories of the Middle Ages actually come from medieval universities. Anchoresses and beguines simply do not get drunk, break into lecture rooms…and play tennis. Yet this was a recurring problem at the University of Paris. One of the most infamous stories comes from fifteenth-century Heidelberg, in a Latin text called the Manuale scholarium. It purports to be a dialogue between two students about various aspects of university life, including the longing for summer vacation and the qualities of the local craft beer. “Bartoldus” and “Camillus” also spend a hefty amount of time discussing the proper hazing of new students. The text presents the ritual straightforwardly, like a script that older students would follow. The “freshman” or beanus dons the costume of a monster, complete with horns and giant false teeth. Bartoldus and Camillus fling insults at the student—or rather, discuss his foulness and stink loudly and crudely but to each other, as if the student lacks even the reason to comprehend words. They eventually recognize the monster as a beanus who aspires to be a scholar, and determine to cleanse him properly. This process involves sawing off the (fake) horns, pulling out the (fake) real, yanking out any (real) nose hairs, shaving his (real) hair, and rubbing (real) album graecum under his nose. To be sure, this last sounds less than terrible…until you realize it was animal dung. Hurting, humilitated, and both smelling and smelling like dog feces, the beanus now undergoes a mock execution and forced confession of his sins (real, fake). And then, of course, he has to buy all his tormentors a round of wine. Now, the Manuale scholarium’s hazing ritual might represent a fictional pastiche rather than a direct description of life at Heidelberg. Most obviously, of course, the text is essentially plagiarized from a similar work set at the University of Leipzig. Yet later evidence suggests that the Manuale’s description either reflected a ritual already in practice or redirected existing practices towards its version, right down to the use of a horned hat and feces. And as with the other vignettes recounted in the Manuale, scholars have looked to contemporary reports from universities across Europe to show that the turbulence of initiation rituals played a crucial role in the formation of late medieval scholars. At Avignon, for example, the unlucky new students of the College of St. Nicholas had to serve the older students at table, and grin and bear the humiliation of being addressed like servants. In Paris, the opportunities for hazing knew no boundaries, where rules attempted to prohibit verbal and physical violence against freshmen “in the chapter, in dormitory, in the schoolroom, and in the gardens.” And somehow this still seems better than the German universities whose statutes had to ban older students from throwing feces and pouring urine on newcomers. The idea of “taking it like a man” evident in bearing the humiliation of destructive hazing rituals actually starts to show their ultimately constructive purpose. University initiations helped create community, but also the right type of man for that community. Although scholars were generally prohibited from the bearing of arms and participation in courtly interaction with women, their typical petty aristocratic background and intended careers in the Church or bureaucracy encouraged—required—the swift accumulation of the other ideals of noble male life. Which is to say, money and alcohol. Fresh from inveighing their parents or scraping together the patronage to pay student fees, new students were typically required to throw a feast for other members of their college or “nation.” (New grad student “TAs”: you’re not getting out of this one, either. Oh, and at Leipzig, you—but not the undergrads you teach—will also be required to tip the servants). Various universities’ rules against excessive alcohol consumption, participation in gambling and hiring prostitutes almost seem to acknowledge their own futility. This was true at the Sorbonne at Paris, where the penalty for calling teachers “drunks” was to…buy everyone a round of wine. It was even more, and even more disturbingly, true at Heidelberg. In 1419, the university decreed that that standard hazing ritual of a student paying for the members of his college to visit the local baths (probably a euphemism for collective hiring of prostitutes) was horrible and financially draining and immoral…unless the people he was treating were the dean of the university and the faculty on the examination committee. Overall, the horrors and hardships of medieval hazing served an important social purpose: the creation of a new, scholarly man out of a wayward youth, construction by way of destruction. Still, not all initiation had to be painful. Wonderfully, medieval Jewish communities in northern France and the Rhineland celebrated their sons beginning formal religious education by baking cakes in the shape of Hebrew letters. And hey, at Orleans, the rules were very clear that whatever extra financial hardships were levied on freshmen, they must never be so severe that students were forced to sell their books. Orleans: recognizing the important things in life since 1365. Finally, as Ruth Mazo Karras suggests, the Manuale scholarium itself was likely intended as a Latin phrasebook to help new students pick up the rhythms “daily use” Latin they would need to avoid the wolves (lupi) ready to pounce on any undergraduates caught speaking the barbarian tongue with punishments ranging from whipping to expulsion. The two fictional interlocutors talk through many of the temptations lying in wait for students torn between their studies and their adolescence. And what sweeter way to convey these lessons and form students into men than by insulting teachers and gossiping about the evils of menstruating women? Ruth Mazo Karras, From Boys to Men: Formations of Masculinity in Late Medieval Europe (Philadelphia: University of Pennsylvania Press, 2003). Alan Cobban, English University Life in the Middle Ages (London: UCL Press, 1999).